London Heathrow to Accra, Amman, Atlanta, Austin, Bahrain, Baltimore, Bangalore, Bangkok, Beijing, Beirut, Boston, Buenos Aires, Cairo, Calgary, Cape Town, Chengdu, Chicago, Dallas, Delhi, Denver, Doha, Dubai, Durban, Hong Kong, Houston, Hyderabad, Jeddah, Johannesburg, Kuala Lumpur, Kuwait, Lagos, Las Vegas, Los Angeles, Madras, Mexico, Miami, Montreal, Mumbai, Muscat, Nairobi, Narita, Nassau, New York (JFK and Newark), Philadelphia, Phoenix, Rio De Janeiro, Riyadh, San Diego, San Francisco, San Jose (California), Sao Paulo, Seattle, Seoul, Shanghai, Singapore, Tehran, Tel Aviv, Tokyo (Haneda and Narita), Toronto, Vancouver, and Washington DC. Meal selection is only for the main course of the main meal. However, you can click on the menu link to see the full main meal menu. Starters and desserts cannot be pre-ordered. Items from the second meals cannot be viewed or pre-ordered. None of the main courses particularly excite me on this menu; has anyone tried the Wonton soup? I have had a BA F wonton soup out of HKG before and it was fine, edible but nothing better and somewhat lacking in flavour for a wonton soup made in Hong Kong. Can't comment on the ex-LHR version. LHR-SIN August CW menu. I know it is late but may still help. This is the menu which wasn't available in advance of my flight. Hmm... that's really weird because it is completely different from the LHR-SIN CW menu I had twice this month! Can you confirm what were your travel dates, as I almost wonder if it was a delayed or early start to the monthly rotation? Any Recommendations or do these menus not exist until sept? The vast majority of menu dishes get recycled every few months. Occasionally, one disappears or another reappears or one gets changed for whatever reason, but the beef fillet with smoked mashed potatoes has been a regular. I tried it once despite my natural worry towards steak on planes because the alternatives I had did not tempt and I loved smoked things generally, but it was really poor, with the cabbage proving an unwelcome watery base to everything else. I find BA risotti invariably overcooked which makes them feel stodgy though I tasted this one and the taste itself was fine. I'd personally choose the pork rib as Chinese mains are usually decent (I believe that they are prepared by a separate caterer). adrianlondon and GGla like this. This for October 2 departure. See the menus below for the meals you'll be served on your flight. Is this J or F? I really don’t fancy any of the starters except the soup. Slightly the wrong thread but it’s pointless me starting a new one. 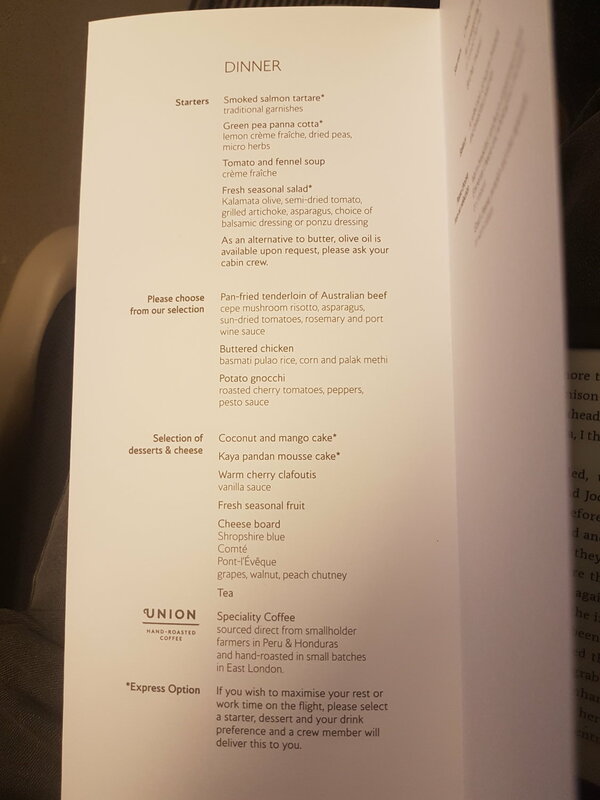 Can someone advise what the meal service in club will be on the BA117? will it be a 3 course breakfast like the normal meal service? The service is from the trolley like the lunch/dinner service so plenty of choice and excellent quality food.